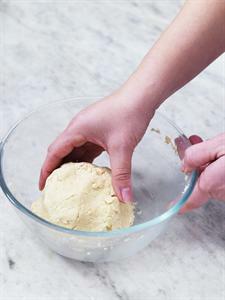 Sieve 225g/8oz plain flour and a pinch of salt into a large bowl then add 125g/4oz cold cubed butter and rub it in using your fingertips until it becomes breadcrumb consistency. Now add cold water, about 1 tbsp at first and bring the mixture together using a round ended knife then use your hands to pull it all together, adding only drops of water as you go. You don’t want it too wet or your pastry will won’t be crisp. 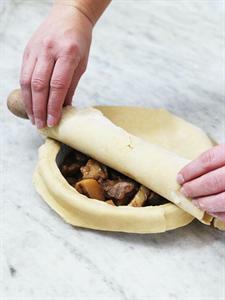 The pasty will eventually come away from the sides of the bowl and the bowl will be left clean. Pat into a round and leave in cling film for 30 minutes to rest in the fridge if time permits or use straight away. 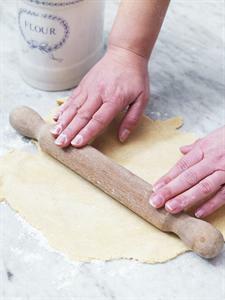 On a lightly floured board, roll the pastry out to your required size, turning it as you go and lightly dusting your rolling pin. Try not to over flour as this will dry the pastry out too much. Drape the pastry over the rolling pin then loosely lie it over the tin. 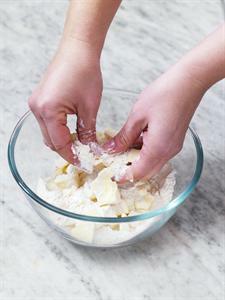 Using your knuckles edge the pastry into the tin letting it over lap the edges. Then roll the rolling pin over the top of the tart tin for a neat edge. Prick all over with a fork. Put in the fridge for 30 minutes to chill, this will prevent the pastry from shrinking. When ready to bake, line with parchment paper and fill with baking beans then put in the oven at gas mark 6/200C (190C in a fan oven) and bake for about 15-20 minutes or until the edges of the pastry are beginning to turn golden. Remove beans and paper, put back in the oven for a couple of minutes then remove and fill with your filling. Or top your pie. 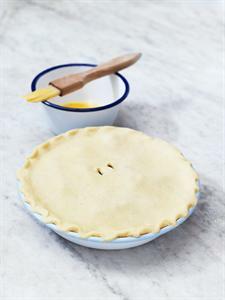 Fill your tin with your pie filling, roll the pastry out larger than the pie tin then cut a width about 5cm/2inch and long enough to go around the tin. 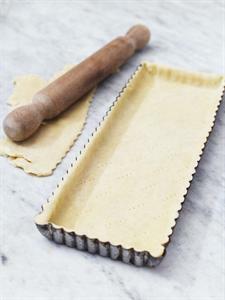 Wet the edges of the tart tin with water then press the pastry piece all around to form a collar. Now wet this and drape the remaining pastry piece on top and secure. Trim the edges and pinch to secure then make air holes on top. Brush with beaten egg and put in the oven at gas mark 6/200C (190C in a fan oven) for about 30-40 minutes or until the pie is evenly golden brown. · To work out how much pastry you need for your tin the rule works best in imperial, though you can convert. The rule is to deduct two from the diameter of the pie dish (in inches) which gives you the required weight of flour required, in ounces. So if you’re using an 8 inch pie dish you deduct two, giving six. So you’ll need 6oz of flour to make the pastry to fit the dish. · Pastry freezes well. Make up to step 2, double wrap in cling and freeze for up to 3 months. Also checkout our what went wrong section for pastry.